Monsters from space: Would we want to know? Should we be told if a monster rock is heading our way? Researchers wrestled with this question on Friday at the annual meeting of the American Association for the Advancement of Science (AAAS) in Denver. Some suggested there was no point worrying the global population about its imminent demise. "If there is absolutely nothing you can do about it - you can't intercept it, you can't move people out of the way - then it makes no sense to incur social costs from whatever panic or overreaction there will be," argued Geoffrey Sommer, of the Rand Corporation, who has been studying how policymakers should react and prepare for Armageddon. "If an extinction-type impact is inevitable, then ignorance for the populace is bliss." But hang on, don't we have a right to know? "I'd certainly want to know and it's not up to some bureaucrat to keep that from me," said Lee Clarke, a sociology professor at Rutgers, The State University of New Jersey. Clarke is an expert in disasters and in organisational and technological failures. He has written about panic, civil defence, evacuation and community response to disaster, and says people tend to react well in a crisis. "The single most important reason there were not more casualties at the World Trade Center collapse was because there was no panic," he argued. "It does happen - there are soccer stampedes and the like - but it is very rare." The possibility of a major impact from space is a certainty. The geological record shows the Earth has been hit many times by large objects - some of which have come close to wiping life clean from the face of the planet. All asteroid researchers say we will be hit again by objects much greater than one kilometre across - although it may not happen for tens, hundreds or even thousands of years. The Spaceguard Survey, conducted by the US space agency (Nasa), is looking for these big rocks with wide-field telescopes. In the space out to about 200 million km, it has so far found about 650 "monsters" - none of which have orbits that pose a threat to the Earth. There is possibly a similar figure of undiscovered one-km-plus-sized rocks in the same region of space that have yet to be tracked down. If a threatening object is found, many researchers are confident Earth will have the time and the technology to do something about it. "We've landed a spacecraft on an asteroid; we have thrusting devices. We don't need a bomb. We could push on it and push it out of the way. "It would take a while but we could deal with it. The real problem arises with comets that come from the deep, dark reaches of the outer Solar System. "We don't see them until they get to Jupiter and they're in the vicinity of the Earth within a few months or a year after that. Perhaps there won't be enough time to deal with that." All are agreed that proper disaster plans need to be put in place now and that the public needs to be educated about the real threat and how we might cope. 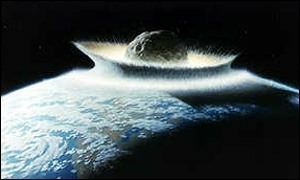 Every year, a small asteroid explodes in the Earth's atmosphere with an energy equivalent to 5,000 tonnes of TNT. Lee Clarke said: "Stuff comes in and it blows up. This sort of thing needs to be common knowledge."